The freedom to farm represents one of the greatest reasons to celebrate Independence Day. We tip our hats to Illinois’ and America’s farmers and ranchers who provide us with a safe, bountiful and dependable food supply. This Independence Day, please extend your thanks to our farmers, who are our neighbors and contributors to the fabric and structure of our communities. Thanks! SPRINGFIELD – Illinois pig farmers honor America through regulatory and voluntary land, air and water stewardship practices. They are, however, in jeopardy of losing many of the freedoms to farm they enjoy due to burdensome and unnecessary regulations at local and state levels due, mostly, to common misconceptions regarding the pork industry. This is according to Jennifer Tirey, president of the Illinois Pork Producers Association (IPPA), who pointed out many of the public misconceptions about animal welfare and modern production practices can be reasonably explained. “Illinois pig farmers are committed to doing what is right to protect our natural resources, support our local communities where we raise our families, produce safe, nutritious food and provide the very best care for our animals,” Tirey said in an email addressing how farming helps ensure America’s continuing independence. “Misconceptions about pig farming continue to be a topic of concern even though most pig farms operate year-round without disturbing their neighbors or their communities. And as many pig farmers are now choosing to raise their animals indoors, the pigs are protected from the harsh, unpredictable weather conditions in Illinois. “Pig farms today also employ modern technologies and innovations that allow us to better collect and recycle valuable nutrients than we did just a generation ago. Manure is now collected in an 8- to10-feet-deep reinforced concrete pit directly underneath the barn and incorporated into the soil on nearby farmland as an organic fertilizer. And as pig farmers continue to improve, the Illinois Environmental Protection Agency’s most recent annual inspection report indicating that less than one percent of all Illinois pig farms had any odor complaints or water pollution violations further reinforces our industry’s commitment to environmental stewardship. “Compared to 50 years ago, pig farmers are using 78 percent less land and 41 percent less water to produce pork. With the added responsibility of feeding an ever-growing population, the reality is that pig farms have gotten larger and more specialized. Today, the average American farmer feeds 155 worldwide. In 1960, that number was only 25. However, many of our farms, nearly 98 percent, are still family owned with the farmers raising their families in homes near pig barns. “As we head into the July 4 holiday, farmers around the country are facing serious headwinds because of export market uncertainty caused by a variety of trade disputes with other countries, Because of its status as one of America’s strongest export products, agriculture is the first to face retaliation in these disputes. “No farm sector has been hit harder by these trade disputes than U.S. pork, which has been targeted with punitive tariffs by two of its largest export markets: China and Mexico. U.S. pork is highly dependent on exports, shipping 30 percent of U.S. production outside U.S. borders. China and Mexico alone represented 40 percent of U.S. pork exports last year. SPRINGFIELD — Five Illinois farm families were honored with awards for their dedication to the cattle industry, continued operational improvements and contributions to the state’s beef industry during the Illinois Beef Association (IBA) summer conference in Galena. Honored on June 14 were IBA Outstanding Junior of the Year Katie Miller of Cambridge, IBA Environmental Steward of the Year Lamoreaux Farms of Lanark, IBA Commercial Producer of the Year ODK Farms of Milledgeville, IBA Seedstock Breeder of the Year Curtin Land and Cattle of Blue Mound, and IBA Farm Family of the Year Pfundstein Farms of Sterling, where the Pfundstein family has raised crops and livestock for seven generations. Congratulations all. 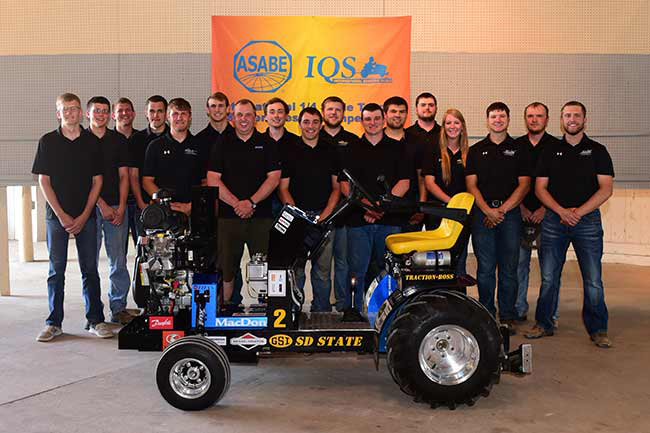 PEORIA —The student engineering team from South Dakota State University took top honors in the American Society of Agricultural and Biological Engineers (ASABE) 2018 quarter-scale tractor student design competition, held at Exposition Gardens in Peoria May 31-June 3. The competition featured U.S. and international teams pitting their design skills against each other to determine who could design the best machine in the categories of pulling, maneuverability and durability. 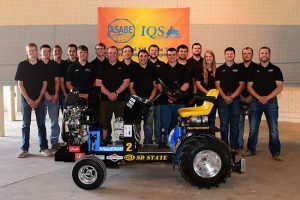 Teams are given a 31 horsepower Briggs and Stratton engine and a set of Titan tires, but the design of the tractors is up to them. A panel of industry experts judges each machine for innovation, manufacturability, serviceability, safety, sound level and ergonomics, according to Curt Thoreson, 2018 competition chair. SDSU finished runner-up in the 2017 competition in Peoria.